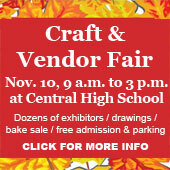 Come join us for the 17th annual arts and craft fair at Westosha Central High School held on Saturday, November 10th, from 9:00 am to 3:00 pm. Dozens of booths will be set up in the gymnasium located at 24617 75th Street in Paddock Lake. Shoppers will find holiday gifts, warm winter fashions, creative arts, bake sale, concessions, drawings, and performances from the performing arts programs. This event is hosted by the Music Parents Association for the purpose of promoting and supporting the performing arts. Please come and enjoy.